Queens University of Charlotte offers a minor in Jewish studies which is housed in the Philosophy-Religion Department. With courses across disciplines and connected to our general education program, Jewish Studies at Queens examines Jewish identity, culture, and beliefs in a broad range of courses covering history, political science, international affairs, religion and theology, ethics, philosophy, sociology, pop culture and more. Courses for auditing, lectures and ‘lunch and learn’ sessions will be made available the broader Charlotte community. 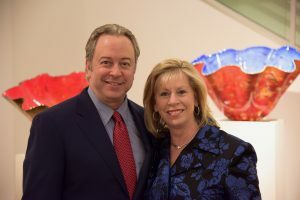 Thanks to the generosity of Lori and Eric Sklut, a $1 million endowed fund has been established for the Sklut Professorship in Jewish Studies at Queens University of Charlotte. Through this professorship, Queens will retain and attract distinguished faculty specializing in Jewish Studies. Rabbi Judy Schindler, associate professor of Jewish Studies at Queens, will be the inaugural holder of the professorship.